The End of Windows XP is Near! Let Psychsoftpc Help you survive the Coming XPocalypse! The End of Windows XP is Near! Don't Leave Yourself Open to Attacks & Viruses! Contact Psychsoftpc Today To Move From Your Windows XP Machine to a High Performance Windows 7 or Windows 8 PC Today! Windows XP support ends soon. Windows XP support ends soon and if you run a business you will no longer be in compliance with many State's Privacy Laws if you fail to upgrade before support runs out. This will leave your company subject to fines and penalties. You may also run into problems processing credit cards since any machine running XP will not be PCI compliant. If you are a health care provider or medical facility, you will no longer be HIPAA compliant if you still have XP machines. Time is running out! You need to act now! Gain as much as 45 extra hours of productivity per year for every five employees upgraded to Windows 7. Since most new software and new hardware will stop support of Windows XP, the ONLY way to take advantage of productivity gains in new software and hardware is to upgrade to Windows 7 or 8. If you need a new printer, good luck finding one with XP driver support. Want to run the next version of Office or Photoshop? Well, you can forget about that if you have XP. Plus, with a newer version of Windows, you can take advantage of a true 64 bit operating system, meaning applications will run better and faster than on the old XP 32 bit OS. Don’t lag behind our competitors! Call Psychsoftpc Now @ 617-471-8733! Keep your systems safe by upgrading to Windows 7 or Windows 8 for ongoing Microsoft support. Those who do not upgrade from Windows XP when Microsoft ends support will be at risk of attack as hackers reverse engineer security updates for newer versions of the Windows OS to look for exploits that may remain unpatched in unsupported Windows XP. "If it does, attackers will attempt to develop exploit code that can take advantage of those vulnerabilities on Windows XP. Since a security update will never become available for Windows XP to address these vulnerabilities, Windows XP will essentially have a zero-day vulnerability forever." 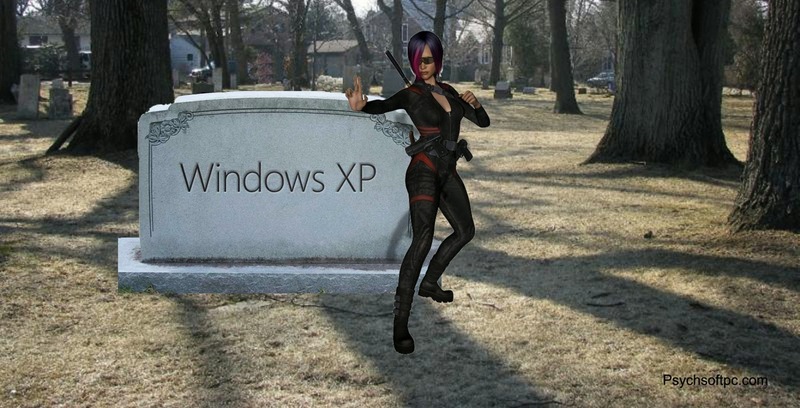 Many antivirus programs, such as the free Microsoft one that so many use will no longer support XP as well. This leaves you open to viruses with no cure available. So, stay safe and migrate now or live to regret it. Don’t risk regret! Call Psychsoftpc Today @ 617-471-8733. Migrating to Windows 7 or 8 will lower your maintenance costs and downtime, leaving you with the peace of mind that you can get things done. Let’s face it, if you are running XP, chances are your computer is as old as the hills, which means it is bound to break down and often. Plus, it probably can’t run all that fancy new software you’ve been hearing about. Migrating now will give you the ability to run newer apps worry free and a rest from trying to keep an old machine running long enough to get your work done.